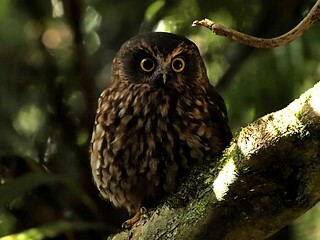 We were in the hills above Days Bay, Wellington, when we disturbed a Morepork. We were privileged to have it come down to us, hopping from branch to branch until it was little more than a metre away. It's behavior was very parrot like - inquisitive, sidling along branches to get closer, doing head tilts, and head swivels. After a few minutes it tired of us and hopped back up toward the canopy. It was quite dark in the shadows, the image quality is quite compromised. The image has been processed through NoiseNinja both before and after being reduced in size.